My darling partner Betty's, niece, Mira, explained to me a little about oriental calligraphy and of course I can't remember all the details but the conversation affirmed that their is an entire culture and a large part of the world that has the wonderful ability to think of the written language as a visual language of pictures or ideograms, fascinating. what an intrinsically artistic culture that must be as compared to our lineal alphabet inherited from the easterly direction of Sumera. I've often signed things with my name followed by a quick cartoon of a horse head. I ramped that up to an ideogram to look like the above illustration. Now I have it in mind to explore what that would look like in a 3 demensional piece of sculpture. probably welded metal. After taking a workshop from master brush builder Glenn Grishkoff, I made myself some brushes using bamboo handles and various brush materials. These images were created with ringtail cat hair. I find contemplating brushwork to expand upon the western process of picture making. "Seeing" is one thing but implementing the "Zen" of the brush stroke is another consideration entirely. I find on 'youtube' demonstrations of chinese landscape painting that reflects the inherent consideration of the brushstroke as well as definition of a landscape done with black ink filters the effort of landscape painting down to its essentials. To combine the two i.e. occidental and oriental landscape techniques is a challenging aspiration. Both SOLD thanks for your support! 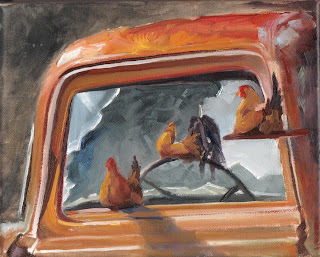 Poultry Paintings or Chicken Scratchings, WhatEverrrrr.........my manager found out I like chickens and suggested I do a "chicken painting" a day and start a "product line". 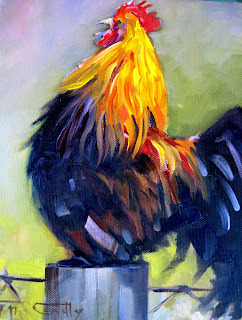 I took her advice and everyday I whip out a painting of a chicken. It's fun. It only takes a couple hours at the most to do an 8x10. 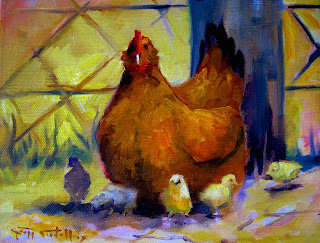 I used to do small watercolors of chickens, mat them and sell them for $15 or so apiece. They disappeared like hotcakes. They are so colorful and a great excuse to have fun with paint. They are very sociable. Watching chickens is like a world in microscope plus the added benefit of eggs for the table. My favorites are banties and Araucaunas. They lay blue and green eggs.